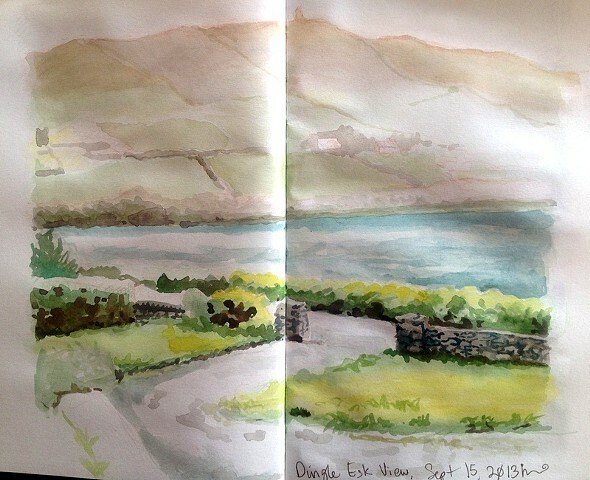 This is a sketchbook study of the view from the dining room where I was living for the month. The driveway went down to a road that ran along the Dingle harbor. Across the harbor is a small mountain ridge & the Dingle Eask, a stone tower built in the 1840s for guiding sailing ships into the "blind mouth" of the harbor. These paintings are commissions for the friends & family who generously supported my travels. Please contact me if you would like to commission a piece from this series.